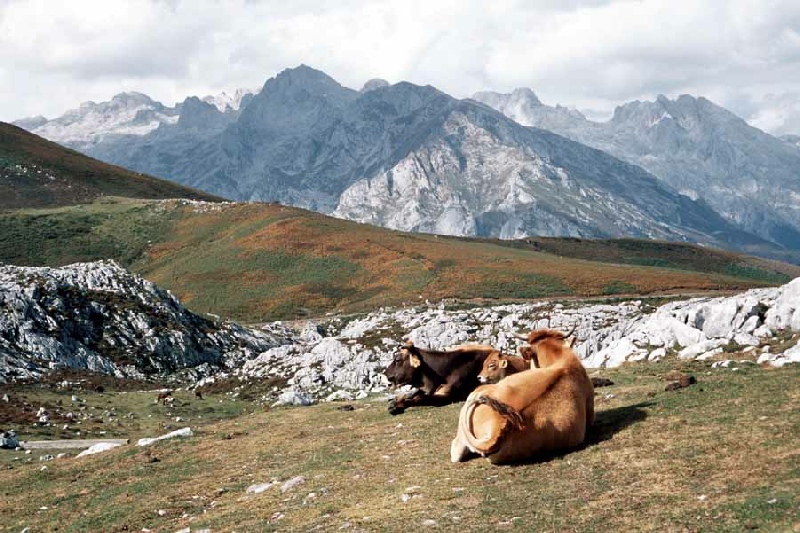 The Picos de Europa rear up like a great wall behind the Bay of Biscay Coast, dividing the hot plains of Castille from the green and gold country of Cantabrica. 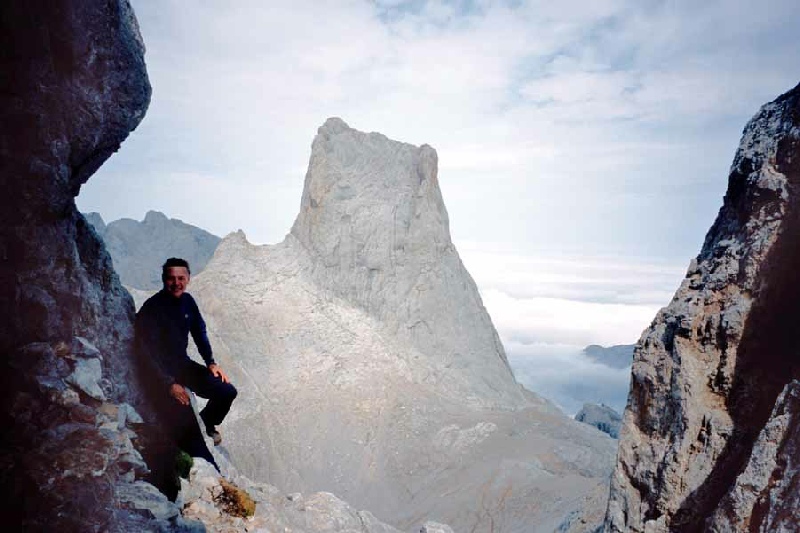 The mountains are modest in terms of altitude but form the largest single mass of limestone in Europe. 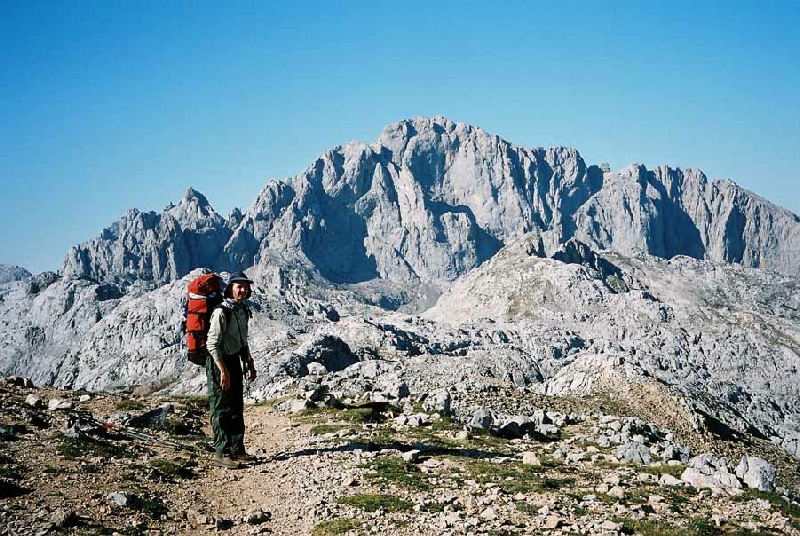 A walk across the Picos has been on the "to do" list for a number of years and was finally completed in September 2006 as a 9 day expedition. The walk was put together to cover as much as possible of the range, crossing from west to east, taking in the best it has to offer. Stop-overs were generally at the location of refuges with a mix of camping and lodging in the refuges. The terrain was found to be extremely rugged and care should be taken in estimating what can comfortably be achieved in a day. Food was available at most of the refuges but a 4 day supply was taken to ensure there were no problems. The guide "Picos de Europa walks and climbs" by Robin Walker was used to help plan the route. 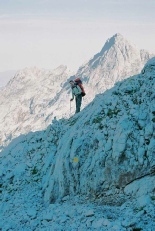 A series of multiday walks are outlined at the back of the book, the inspiration for the route being the "Traverse of the Three Massifs". Although consulted at the planning stage, the lack of detail and maps meant the guide was not found to be very useful on the trip. The book was first published in 1989 and has not been radically updated since then. Up to date route information on path conditions was gleaned from the wardens of the refuges. Trip members were Peter and David. Further pictures are here. 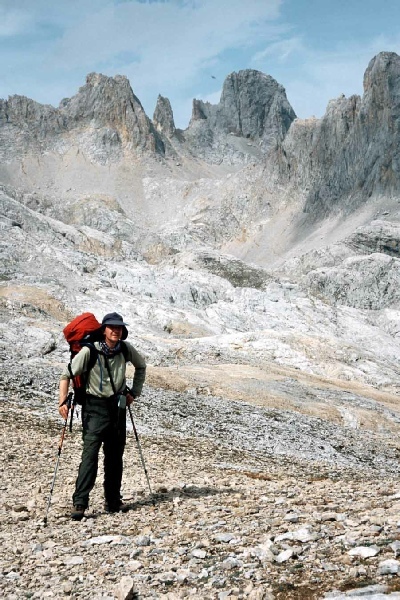 A DVD of the expedition is available for those planning to walk in the Picos de Europa. Make sure your boots and feet are in good condition and well walked in before the trip. The terrain is very tough on the feet. Camping is possible at or near all the refuges. Get up and start early so as to give plenty of time for relaxing and recovering after each day. Be prepared not to meet many people on the trail out of season. Way marking is good in places but diffuse or non-existent in others. Good navigational skills are necessary. The weather can turn nasty so be prepared. Thunder storms were common in the afternoons along with thick mist. Mobile phones do work on some sections of the route. Take plenty of film or digital memory for photographs. After a good nights rest in a pensione in Cangas de Onis, a taxi journey took us to the start of our walk at Soto de Sajambre. The track from the village went gently up through fields and then more steeply through woods towards the Refugio de Vegavano. The weather was incredibly hot and the stop at the refuge for a drink was a welcome relief from the weight of our packs. The refuge looked very welcoming and a stay at the refuge will definitely form part of a future trip to the Picos. The path above the refuge was wooded for a time, passing an impressive oak tree. The woods were cleared at Collado El Cueto and a broad grassy spur followed round the big walls of Los Moledizos. The path steepened and the first set of screes encountered on the Canal del Burro. The rocky route to Vega Huerte was well marked with yellow flashes and cairns. The campsite location is wonderful with magnificent views of the South Face of Pena Santa de Castilla. A water pipe spring is sited just below the campsite. A fine evening followed watching the sun set and the full moon rise up. The yellow paint marks were picked up near the campsite leading us through a boulder field below Aguja de Corpus Cristi. This was our first taste of the classic Picos limestone landscape - dramatic and barren. The route was indistinct in places and involved crossing a vast expanse of scree keeping high to avoid the descent into the La Llerona hoya. The ascent to the Horcada de Pozas was followed by a traverse of the Hou las Pozas, all the time keeping a watchful eye for the yellow flashes to avoid getting into some very rough terrain. The traverse continued round La Torrezuela until an excellent track was picked up below Torres de Cebelleda. 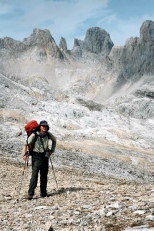 This lead gently down toward the Refugio de Vegarredonda. The refuge was a very welcoming and well run establishment. 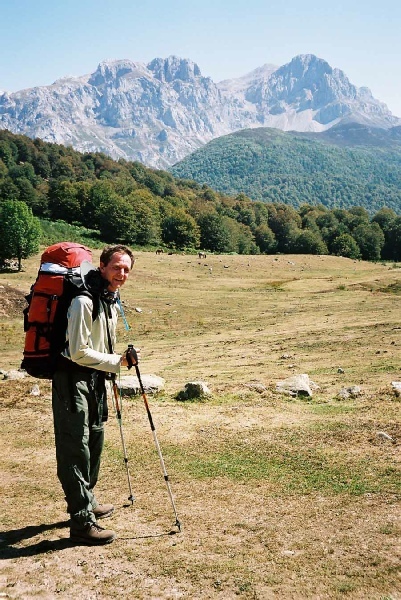 Camping is allowed further up the valley at the Refugio Antiguo but not near the refuge. After a break for a bite to eat we set out to visit the Mirador de Ordinales in order to capture the superb views from this natural balcony. An easy path lead from the refuge to the Mirador in about 1.5 hours. The trip was made all the more worthwhile by a close up view of a formation of vultures as they soared past the viewing balcony and up the nearby cliffs. A good path lead from the refuge past a series of huts at La Rondiella. The walking was pleasant contrast from the hard rock of the previous day as we crossed rich flat meadow pastures. A track was joined at Vega La Piedra and followed to the entrance to the Refugio Cabana de Pastores at Vega Enol. After cutting across fields we picked up a path leading south of the Oicu'l Mosquital towards LLagu de la Ercina. A series of farm houses were passed on the way down to the lake and we were struck by how there could not be many places in Europe left with such a rustic life for the farmers. The southern edge of the lake was skirted and the path to Vega Aria joined. The climbing was gentle and we gained our first views of the Central Massif in the distance. After the collection of shepherds huts at Las Bobias, an excellent spring was sampled. We had been told that water was a problem at the refuge so we took advantage of this to fill our water carriers to full capacity. The path was well marked all the way to the hut. At the hut we met up with 4 other British walkers doing variations on the theme of our traverse. The weather closed in with some thunder during the afternoon but cleared in the evening to allow us to ascend Hultaya peak. The path to the Canal de Trea was taken then an easy spur followed to the summit. The views across to Western and Central Massif were stunning and highly recommended. After a early start we retraced our steps from the previous night to the top of the Canal de Trea. Good way marking leads part of the way down the Canal and then stops. Don't be too alarmed, this is where the warden of the refuge was told to stop by the National Park Authorities. The descent is steep in places with unpleasant sections of small stones. After 2 tumbles by one member of the party but no damage we finally finished the descent into the Carres Gorge. The excellent path was followed into the Gorge for about an hour before turning back towards Cain. The sheerness of the walls was incredibly impressive and well worth the detour. The crowds in Cain were quite a contrast to the solitude of the previous days. It was festival time and the place was heaving. Cain was a good place to stop for food with a small supermarket and plenty of restaurants. Debate followed as to how to approach the long walk to Posada de Valdeon. In the end the road was taken which actually was more pleasant than we imagined. Rather than find accommodation near Posada de Valdeon, we carried on to Santa Marina de Valdeon in order to get all the road walking out the way. S M de Valdeon has an excellent albergue and a stay here comes highly recommended (see details in accommodation). The road from S M de Valdeon was taken until a stream was crossed. An indistinct path lead to the hair pin at Canabedo and then upwards to the Rio Urdias. A good path was found and this lead to the Sedo de Remona and the Canal de Pedabejo. The ascent of the Canal is steep but the effort was rewarded by good views when the coll was reached. The was followed by a very pleasant walk across the Vega de Liordes valley, a suggestion for an excellent campsite.. The path from Fuente De was joined and followed without any difficulties to the refuge. Water for the refuge is quite a distance from the hut on the lower approach path. It is well worth filling containers on the way through since water is not available at the hut. We arrived quite early and set up the tent in readiness for an approaching thunder storm. This turned out to be a serious downpour and the stereo effects heard from within the tent of the thunder as it rolled across the mountains were really impressive. Day 6 of the walk has the reputation for being the toughest of the tour so we took advice from the refuge warden on the route. He advised against our proposed routed via the Hoya del LLambrion and Hoya Grande, stating that the path was in terrible condition and there had been a number of accidents this year alone. He advised an alternative route, advice which we gladly accepted and put to use on the following day. Our route from the previous day was retraced our steps until we almost reached the path junction at Vega de Liordes. A cairned way marked path was found and followed up the Hoya del Sedo and on towards the gap below Madejuno peak. The walking was rocky but pleasant. At the gap, Cabana Veronica was seen in the distance, glisening in the sun. The path continued across the limestone desert, winding its way between deep clefts in the rock. The Cabana was reached after about 1.5 hours of good walking from the gap. The Refugio is the most bizarre affair - a redundant gun turret from an American WW2 warship - but the food that was being served up for lunch looked excellent. Book early to avoid disappointment! The descent to Vega Urriellu appeared very straightforward on the map but the devil is in the detail. The steep incline down the Horcados Rojos is protected by a wire, but even with this aid, it is not pleasant. The rock is broken and unstable which makes footing very unsure. Once down, the route to the Refugio was pleasant and we arrived to see the West Face of El Naranjo bathed in sunshine - a truly memorable sight. The evening had an added dimension of an unfolding epic high up on the West Face of El Naranjo, which was eventually safely resolved. Food at the refuge was excellent and the canteen was full of talk of exploits on the rock faces being planned for the next day. 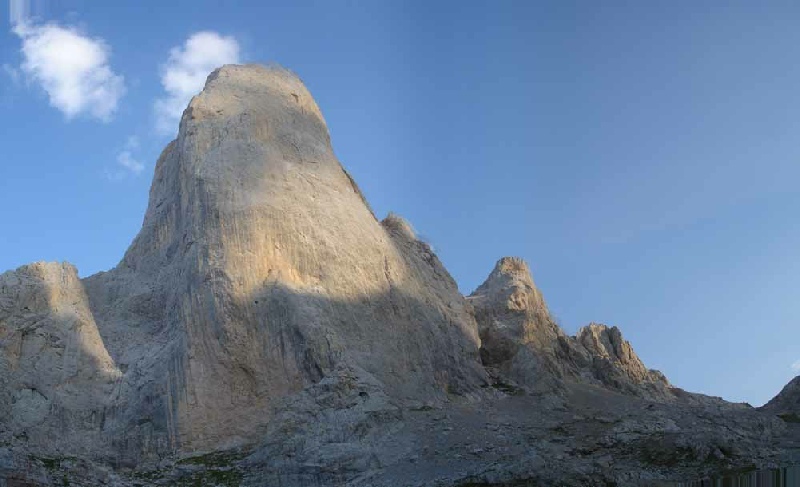 The path from the refuge winds its way around all the rock faces of Naranjo de Bulnes so it was a great opportunity to pick out potential rock routes for a future visit. 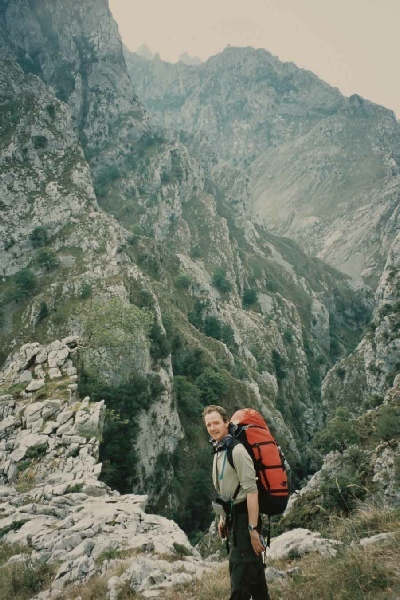 The route climbed towards the Colla de Celada then steeply up scree to Colla Bonita. 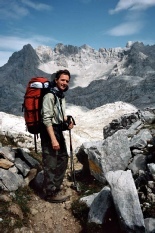 At this point David came very close to loosing his beloved rucksack down 1000ft of scree when it launched itself from a resting position and was only stopped by a skilful rugby tackle before picking up full descent speed. Our difficulties for the day were still not over as a dense mist then formed to hinder our navigation to the refuge. Eventually a building loomed out of the mist as a most welcome sight. 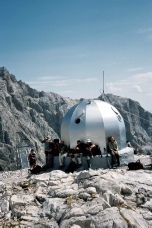 The Hotel - Refugio is excellent with very comfortable rooms and brilliant food. It was also great value for money - recommended. The track down the Llomba del Toro took us down towards Vegas del Toro at which point we branched back into the Central Massif mountains again. Height was gradually gained steadily up the Canal de Fresnedal towards the Colla Cambureru. Mist had formed by the time we reached the coll but with the hope that it might clear we set off up Pene Castil. The reward for our climb up the peak was the gradual thinning of the mist to reveal the panorama of the Central Massif in all its glory. 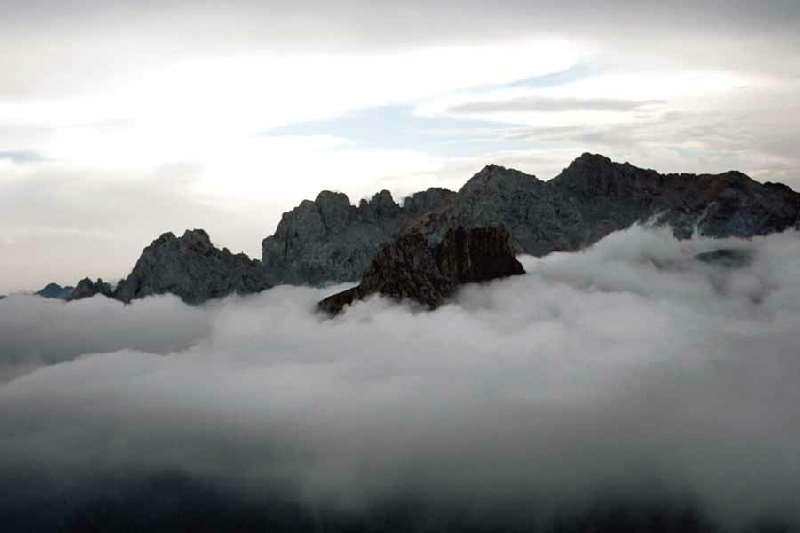 The views were truly stunning as the mist swirled and wound its way up and around the Naranjo de Bulnes and the other peaks. Definitely a top 10 lifetime mountain moment. Descending back to the coll, the mist thickened again and we spent the rest of the descent relying on compass bearing for directions. Eventually the ruined settlement of Mayada Las Monas appeared through the mist and allowed us to safely descend down the Canal de las Monas to the refuge. Refugio de la Terenosa did not have a warden and was opened up for us by the farmer living next door. A very peaceful night was spent by torchlight as we cooked our remaining food. The path from the refuge lead to the track towards Inverales. It was with some sadness we finally left the Central Massif - they had been tough but had rewarded us with some wonderful moments to cherish. Sotres was a good spot for a late breakfast before making our way towards Treviso. The road was surprisingly pleasant to walk along and the miles disappeared very quickly. The famous blue cheese of Treviso was sampled as part of a good lunch in the local cafe / bar and then the final descent to Urdon started. A quite remarkable path descends in a seemingly endless series of hairpins, coming out at the road in Urdon after about 2 hours. After some wonderful walking amongst these amazing mountains, we hitched a lift back towards the Coast heading for the gastronomic delights of San Sebastion. The mountains offered a great challenge for a multiday walking trip and it was clear from our experiences they did not suffer fools gladly. 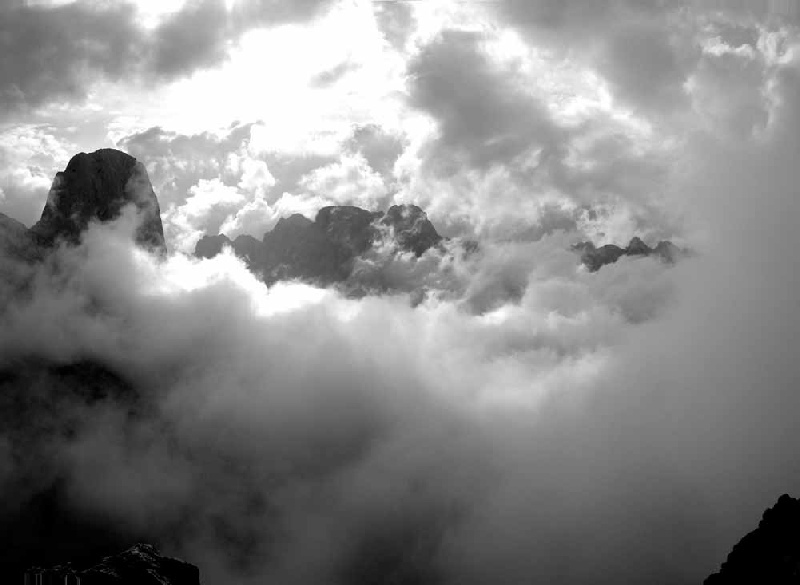 We had been rewarded with some truly memorable mountain moments and rare solitude. All in all, to be highly recommended.